"If Death Be My Destiny..."
Karen: Our story opens just twenty minutes after the end of last issue. 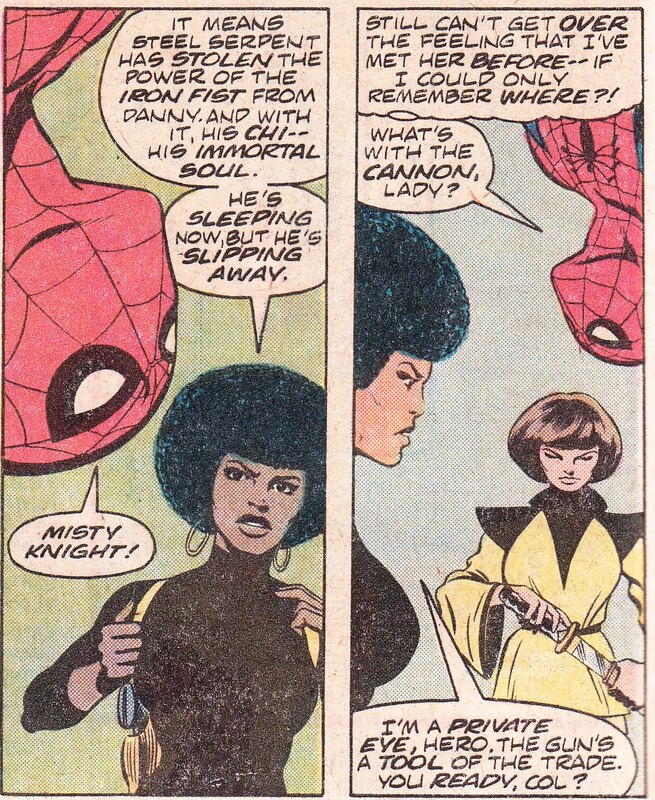 Iron Fist is resting in bed at his friend Colleen Wing's apartment, with his former lover Misty Knight by his side. 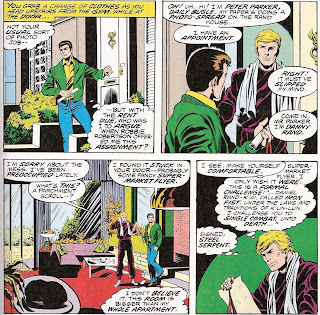 Colleen and Spider-Man step out of the room to discuss his condition with a doctor sent over by Iron Fist's lawyer. She says that Iron Fist should be "up and around in no time." But Colleen says that what's affecting him is of a spiritual, not physical nature. One thing that puzzled me: as the doctor leaves, she says Iron Fist should be in a hospital. I thought he was going to be fine? Doug: First, Misty's still channeling her inner Pam Grier with that dress! Second, with the hairstyles on the lovely ladies in the foreground, I can't decide if I'm watching Charlie's Angels or Saturday Night Fever -- I loved the '70's! As to the contradiction, it's almost like Claremont started writing the captions, left and went to dinner and a movie, and then came back to it without reading what he'd done prior. Like you, I don't get it. And does Spider-Man just seem like a fifth wheel so far? Karen: In a way, he does, because these two issues really should have been issues of Iron Fist. But the story needed to end somewhere, so MTU was as good a place as any! As she looks down on the unconscious Iron Fist, Misty spills her guts, saying that she hated to be forced to choose between IF and her principles. It really behooves the reader to be familiar with Iron Fist's previous series! 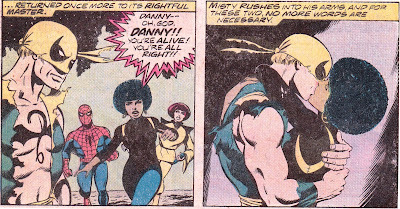 She professes her love for him, and Danny (Iron Fist) awakes and tells her he loves her too. Awww. 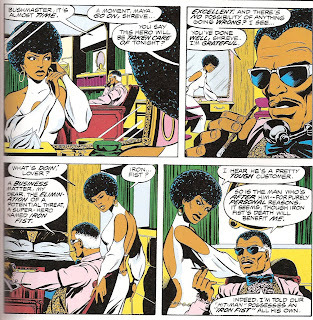 Doug: I've been digging through what remains of my memory since I read this story last week -- do you (or any of our readers) know if this is the first interracial relationship at Marvel or DC? I'm thinking I must be mi ssing something obvious? Certainly by 1978 this was not uncharted territory in pop culture, but darned if I can recall anything from comic books. At any rate, it is a touching scene -- I'm sure we've all seen similar play-outs on film and television. Karen: It seems like it could be the first interracial comics relationship. Well, unless you count some of the Legion relationships, but since green and blue skinned people don't exist on Earth, I think we can disregard those. I think the first interracial relationship I can recall was in the Killraven series in Amazing Adventures, which preceded Iron Fist by a couple of years. Supporting characters M'Shulla and Carmilla Frost were an interracial couple. Of course, that series was outside mainstream Marvel, so Misty and Danny carry more weight. Back in our story, Spidey tells Colleen exactly what put IF in such bad shape -basically he recaps last issue's climactic battle with Steel Serpent. Just as he finishes talking, Misty enters the room in a skintight black outfit including a huge pistol. She says that IF has had his chi -essentially his soul -stolen from him, and will die if they don't get it back. She and Colleen prepare to go after Steel Serpent when Spidey comes to a realization: Steel Serpent will come to them to kill IF and make certain he can never reclaim his power. It's nice to see Spidey's experience in the super-hero game demonstrated so well. Karen: Spidey was correct: Steel Serpent is on his way. He reminisces about his past and we learn who this villain truly is. He's Davos, the son of IF's martial arts instructor, Lei Kung the Thunderer. This is why IF was so puzzled by his foe - at first he thought Serpent was Lei Kung. It seems that back in the city of K'Un-Lun, Davos had battled IF's father for the right to face the dragon Shou Lou and had lost. Boy, this probably doesn't make a lick of sense if you haven't read Iron Fist! Anyway, after his defeat, Davos had gone off to face the dragon, to try to claim his power, but failed. Disgraced, he was exiled from K'Un-Lun and has spent the twenty-plus years since then planning his vengeance. Doug: Count me among those readers who may have felt like they were on the outside of the fence peeking through a knothole! Man... I was glad Claremont included all of the backstory (a total of 2 1/4 pages), but I remained a bit confused afterward anyway. Karen: I really wondered how confusing this story was to people who had no prior experience with Iron Fist. He has a pretty complicated back story. Before Steel Serpent can get to Iron Fist, Spidey spots him on a nearby rooftop and engages him. Spidey gets tossed around and realizes that he's holding back because Serpent is not super-powered. 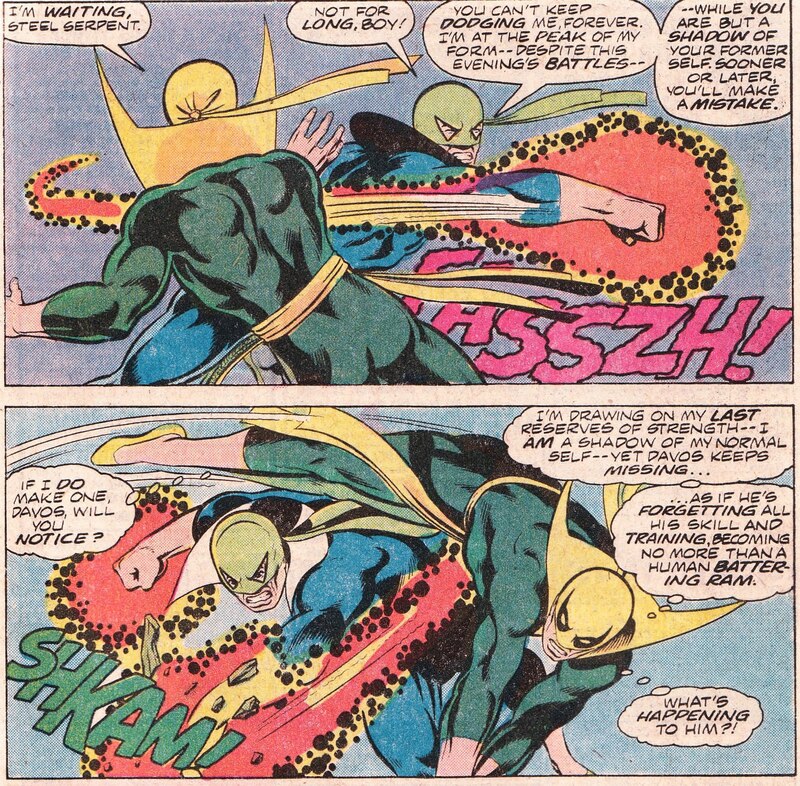 But his martial arts ability -and the iron fist -make him a real threat. The Daughters of the Dragon -Misty and Colleen -show up and have the Serpent on the ropes briefly, but Spider-Man accidentally gets in the way and the Serpent busts free. Doug: Again, Spider-Man is a complete doofus in his own book. And therein lies the danger of a team-up book. In order to make it interesting, both the star (in this case Spidey, but it could be the Thing or Batman) and the guest-star must by necessity decrease their star power, or at least adapt it to the presence of the other. You can't tell me that Spider-Man couldn't have taken down Steel Serpent by himself in his own mag. Did you think this guy was more of a threat than Doc Ock, or the Kingpin in a close-quarters fight? Karen: No, and I didn't think Equinox should have given Spidey such a hard time either. I don't know if I am over-estimating Spidey or under-estimating these villains. Spidey pursues Steel Serpent, but gets cornered in a backstop on a playground -yes, a backstop. Doug: How would one "smash the whole thing down" when said "thing" is made of chain-link fencing? Personally, I'd have liked to have seen Spidey grab the backstop and encase Steel Serpent in it. 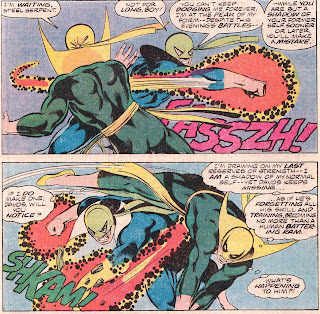 I guess I don't see that possession of the "iron fist" translates to super strength on Serpent's part. Karen: I always felt the iron fis t was a little nebulous in description -much like Thor's hammer, it seemed to develop convenient abilities at times! Just as it seems Spidey's about to get pulverized by the Serpent's two glowing fists, the real Iron Fist makes the scene. Danny's in bad shape, but it doesn't matter, as Davos has lost control of both himself and the iron fist power. The glowing energy begins to burn up the length of his arms, eventually setting him afire. Iron Fist sees his chance and grabs Davos, trying to reabsorb the iron fist. There's a huge, blinding explosion, and Misty fears for her love. But emerging from the scorched ground is Iron Fist, a bit worse for wear, but back in possession of his chi and his power. Davos, it seems, was completely disintegrated! As the heroes walk off into the night, Spidey asks Misty where he's met her before. She says he and a "dude in a flyin' bathtub" saved her a few Christmas eves ago from some muggers. This was a reference to Marvel Team-Up #1, where Spidey and the Torch rescue a woman -Claremont just retroactively made that woman Misty! Doug: The climactic battle in this issue played better for me than the fight in the previous issue. The Kirby Krackle was very cool, and I thought we got some real pay-off -- there was some excitement building here that I felt was lacking the previous month. Karen:Don't you dig how Byrne depicts energy and fire effects? I think he did a great job with that. In a post-script, we see the city of K'Un-Lun, high up in snowy mountains. Lei Kung the thunderer sits before a huge green crystal, where he has seen the events that have transpired, and mourns for his son. For Iron Fist fans, this was a nice way to wrap up not only this two part story but the unresolved plots from his recently-cancelled title. I thought this two-parter was very enjoyable in both story and art. Doug: Personally, I've liked our Havok/Thor and Yellowjacket/Wasp look-ins better. But, as I said at the top of last week's review, I knew going into this story that you were going to like it better than I. And that's not a knock on the story necessarily -- I wouldn't say Claremont was totally off his game, and I'll agree that Byrne's art is very, very solid (hey, a kudo to inker Dave Hunt, too). 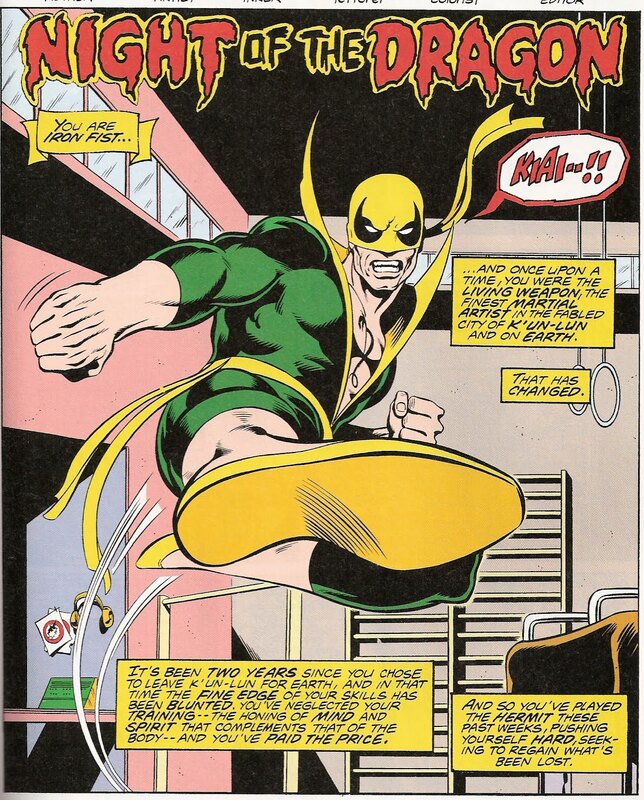 But not being an Iron Fist fan from way back, I sort of felt like I was late to the party. Karen: I enjoyed re-reading these issues, but I can see just how completely stupefying they might be to somebody not familiar with Iron Fist. 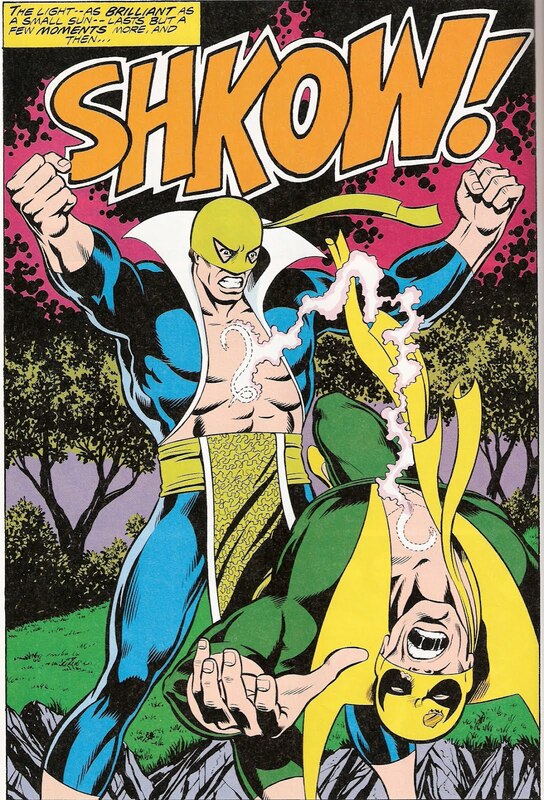 I really hope when the second volume of Iron Fist Marvel Masterworks comes out, they think to include these two issues. 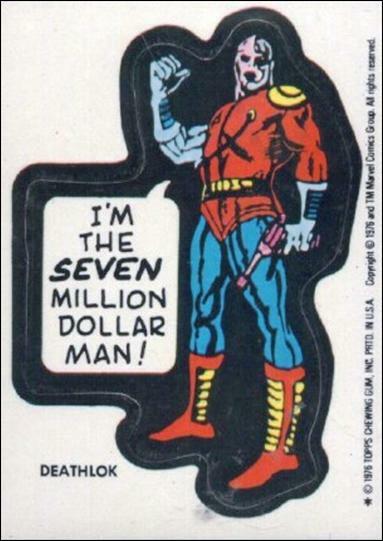 It could have been worse -Aquaman, maybe? 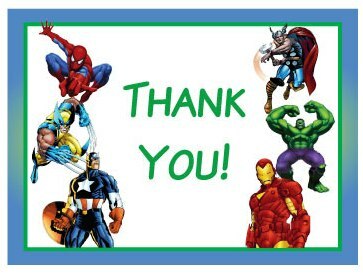 Doug: As I type this Friday afternoon, you have left almost 90 comments on our blog since this week began with Monday's Marvel Team-Up post. Periodically, when Karen and I have wished you well on a holiday, or when we've published an anniversary post, you've told us how much you appreciate coming here each day. Today we'd like to just reiterate that you are the reason we write this blog. 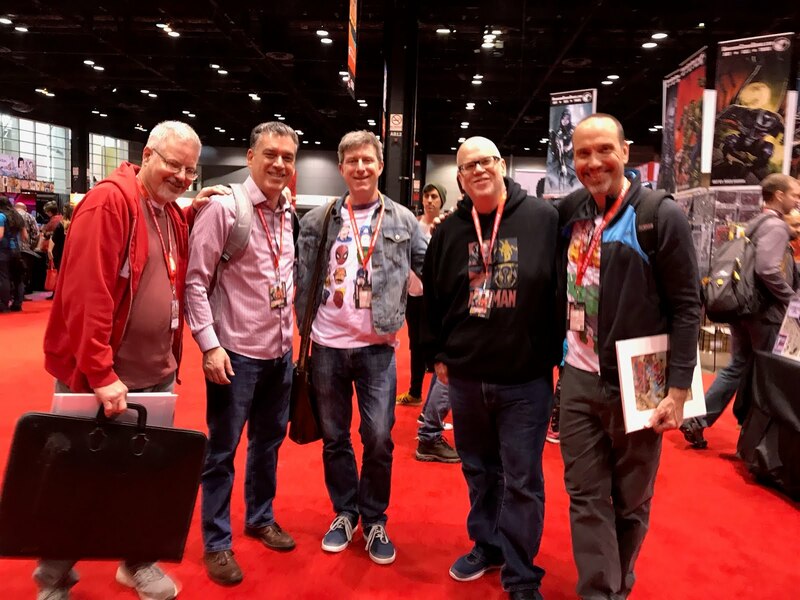 Sure, it's a little selfish because it's an excuse to read comics we've perhaps not seen since we were kids, but overall it's the sense of community that makes us smile. We appreciate each and every one of you, commenter and lurker alike! Karen: What he said! I've been pretty busy of late and don't post all the time, but I do read every comment. That sense of community is what we were hoping for when we started this blog. Thank you for creating that! And might I add - Excelsior! Doug: Happy Friday, everyone -- another weekend staring us in the face! Last weekend our friend Rip Jagger published a cool post about the brand-spanking-new Marvel Firsts: the 1970's Volume I. Rip was kind enough to provide cover images for all of the books contained therein. I know I have my copy on reserve from Amazon.com, and I'm sure it will arrive soon. 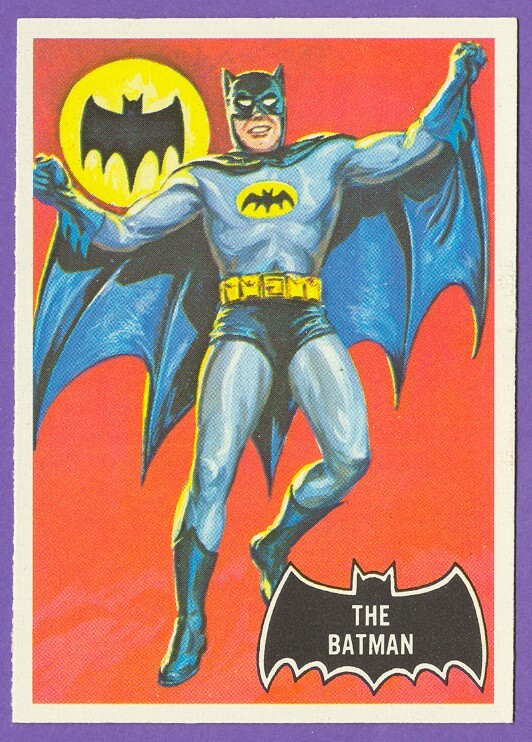 For DC you can go with whatever you want -- so many characters (Batgirl, Elongated Man) had back-ups in some of the Bronze Age mags that I don't know if we should consider those as solo series or not. 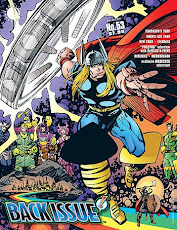 Doug: We're halfway through a month of random issues of Thor. However, today and next Thursday actually contains consecutive issues in the middle of a Thor/Hercules team-up. While you'll have to suffer through the lack of a beginning, I don't think you'll be disappointed in the action you'll see today. 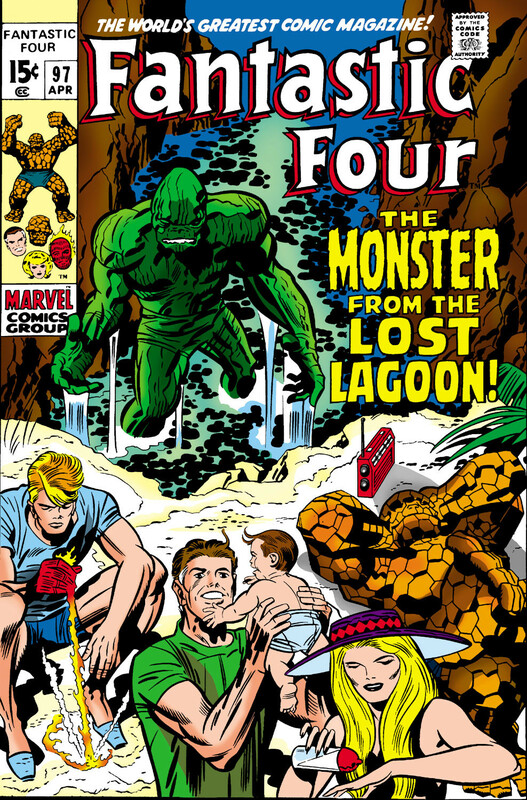 And that art... truly, this was John Buscema and Joe Sinnott at the height of their collaboration! 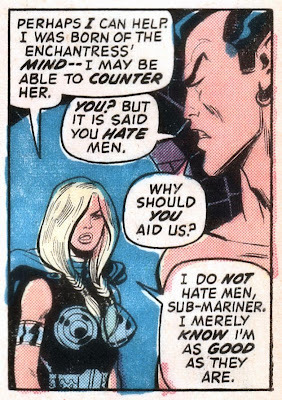 Karen: I really liked it when Gerry Conway brought Hercules back into Thor. The two made a great pair, with the boisterous Olympian playing well off the grim Asgardian. But the two of them together were often complete lunkheads. Doug: We next look in on Ares, as he was meant to be -- the Greek God of War, and a bad guy (hear that, Bendis?). 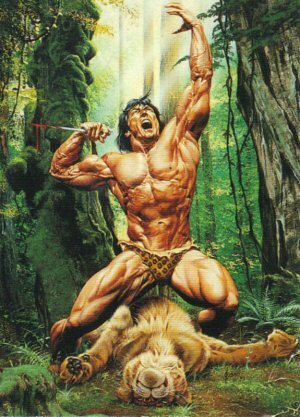 Ares wanders on a mount through a woods, when he stops to slake his thirst. While drinking, a troll emerges from the pool and tells Ares that Pluto wants him as an ally in the killing of Hercules. Ares, feeling somewhat slighted by the messenger and not a little perturbed, agrees to meet Pluto at the gates of Hell. And off he rides, brooding. Karen: I still do not understand how Ares became an Avenger. It's as if no one at Marvel had ever actually read any books he had appeared in. Karen: Conway's Odin was a definite improvement over Stan Lee's. One began to wonder if Odin was senile when he kept taking Loki's word over Thor's! But this Odin has mellowed and come to appreciate his fair-haired boy. 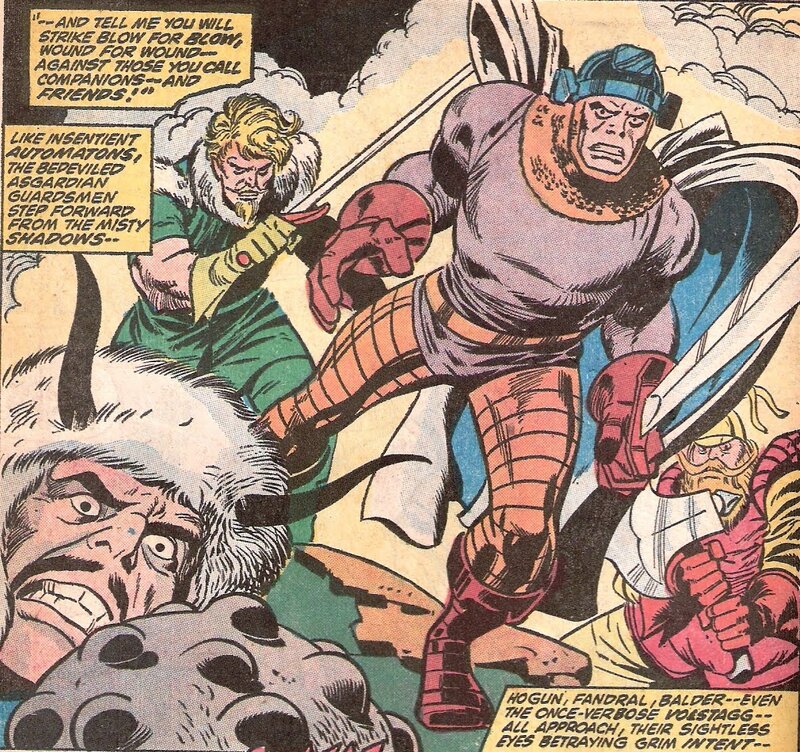 I've always thought that Buscema's version of Odin actually looks a lot like the artist himself! No, they didn't both have long white beards, but there's something about the All-Father's face that reminds me of pictures I've seen of Big John. Anybody with me? or am I out on a ledge by myself here? Doug: I can see that. 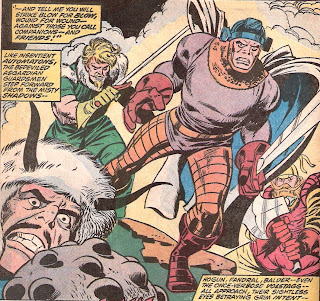 Big John has often been called a big bear of a man, and Buscema's Odin is a massive fellow. Another trait of the artist was his gruff manner -- when's the last time you ever thought of Odin as cuddly? Doug: As Thor and Hercules walk toward their destiny, they are suddenly descended upon by an army of trolls. Their mistake. The thunder god and demi-god lash out with no holds barred. 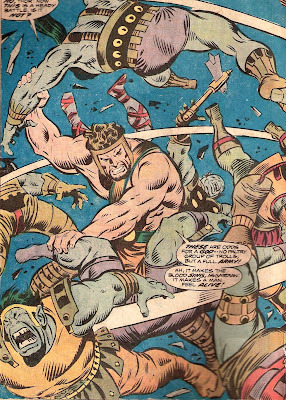 Of course Hercules is having the time of his life -- any excuse to scrap is a welcome diversion. But it's a violent Thor who offers no quarter, taking full advantage of his mighty sinews and the destructive power of Mjolnir. Trolls lie scattered about the land. Thor and Hercules, surprised by the attack, wonder if they should not think about how Pluto is operating through this. 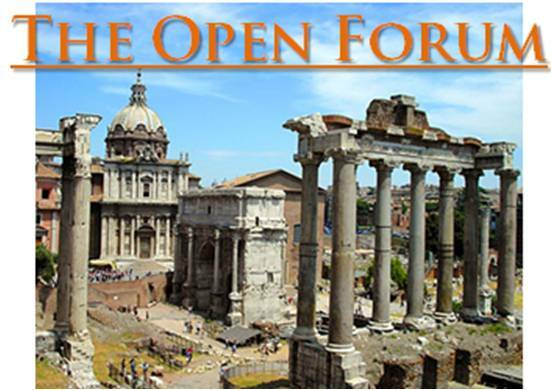 Hercules decides that they should go see an old oracle. Karen: I guess there is a brain in that curly-haired noggin. The idea of visiting an oracle is perfect for this Greek hero. 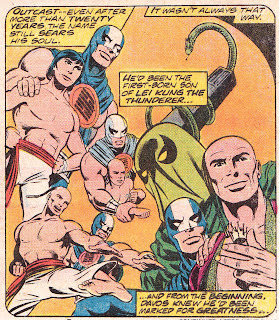 I really enjoy the mythological stories in Thor and the cross-pantheon ones especially. 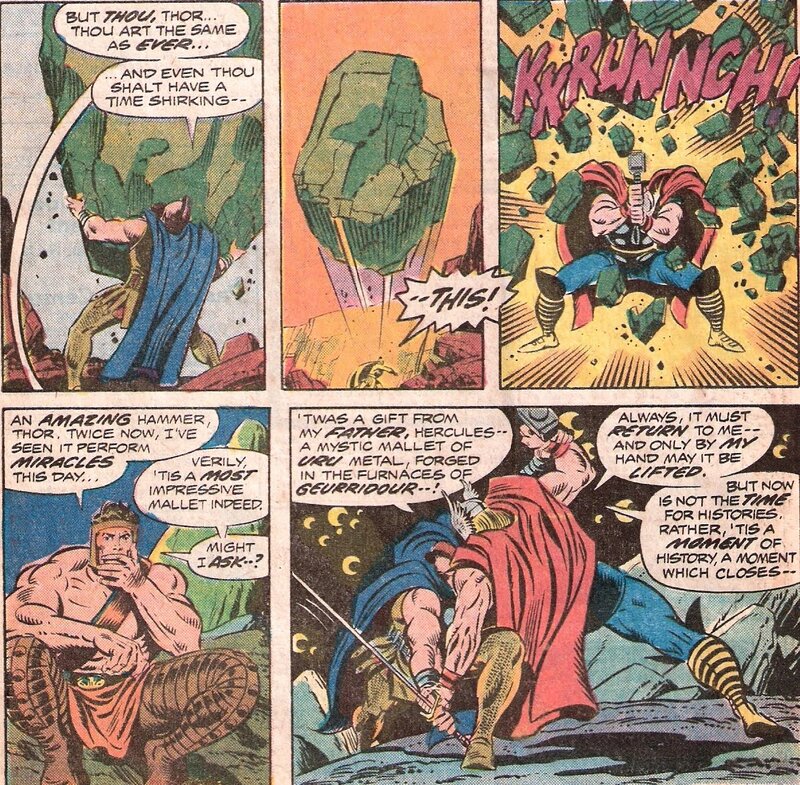 This was Conway's tribute to the Lee-Kirby Thor classic where Thor went to the Underworld to save Hercules, and he does a great job invoking its memory without copying it. 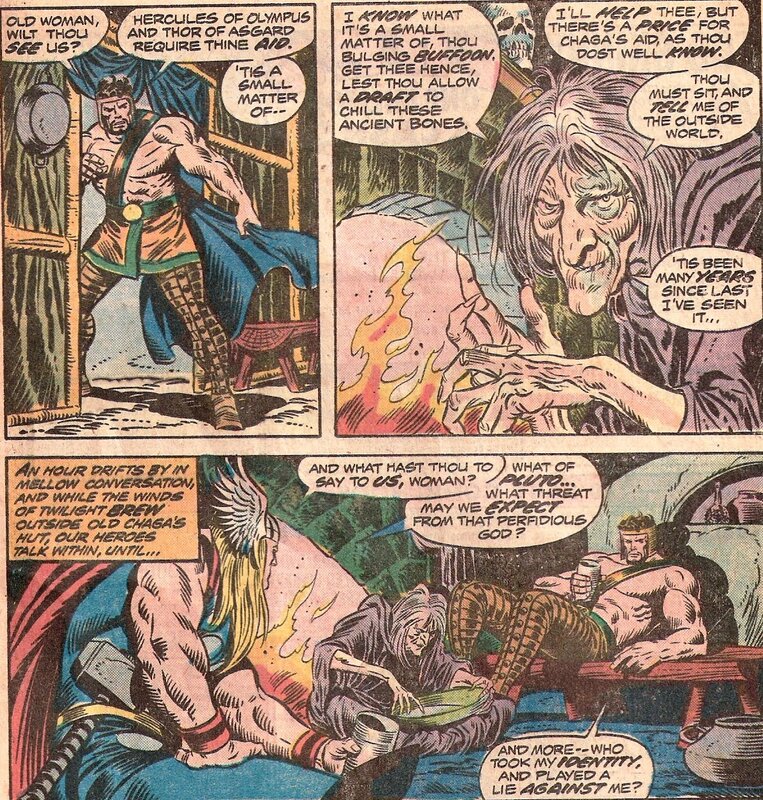 Doug: John Buscema's at his best when drawing the odd, the old, and the ugly. In the case of Chaga, he gets a three-in-one. 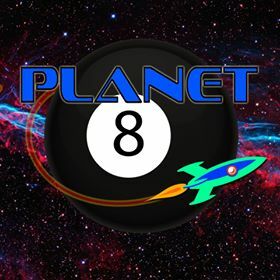 She tells our heroes that it is not Pluto they will next encounter, but Ares! And encounter the God of War they do -- but it's Thor who requests the pleasure. 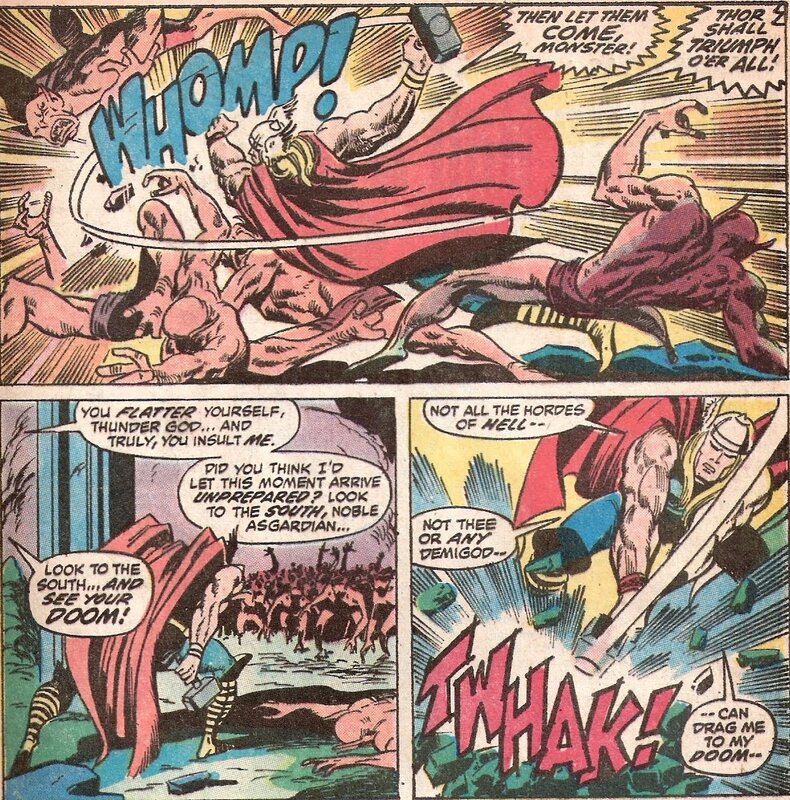 Herc defers, and as Thor battles it's pretty funny to watch Hercules sit on the sidelines and actually engage Thor in conversation! But Ares has increased his strength threefold, so this is no light work. The battle rages, until finally gives him a one-two of Mjolnir across the chops and huge uppercut that finishes the fight. Making a death pact, the two godlings enter the cave that will lead them to the depths of Hell. Karen:It's always exciting to see Thor cut loose. When battling godly menaces, he can really go full out. 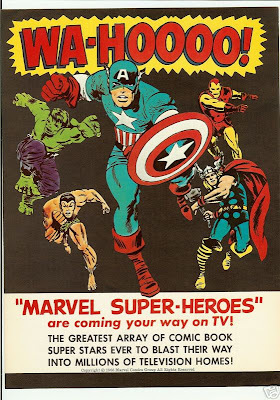 And I agree with you about Buscema -his "characters" were always a delight to behold. Doug: This issue was a flat-out blast, and it's due in large part to the phenomenal artwork. 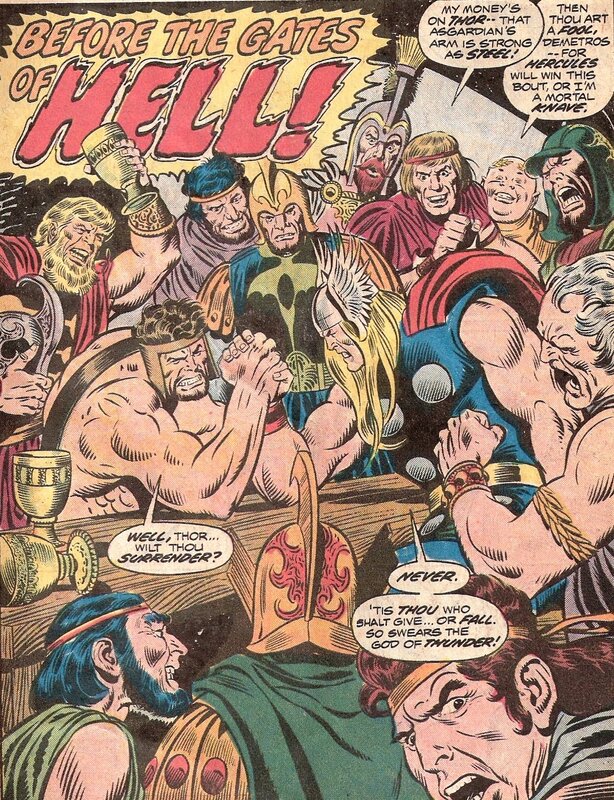 Sure, Gerry Conway crafted a cool story (as I said, I don't have the first part, but we'll look in next Thursday at Thor #223 to see how this progresses) -- anytime you get Thor and Hercules together it's going to be a party. One would have to be a pretty poor writer to screw it up -- so Conway does what he should here and let's John Buscema just run wild. If I sound like I'm gushing... well, I am. 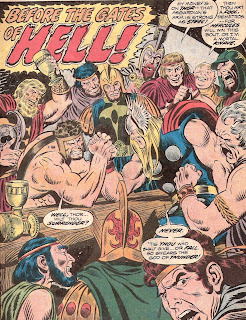 From the splash page to the concluding brouhaha between Thor and Ares this was 20 minutes very well spent. Hmmm... isn't that the way comics are supposed to be? Karen: J.A. Morris' recent posting of a link with an interview with Joe Sinnott made both Doug and I realize we had been mispronouncing his last name our entire lives! Turns out the emphasis is on the first syllable. 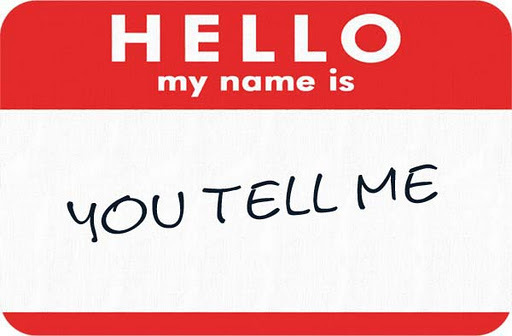 This got us to thinking about other comic book creators' names we've mispronounced or been utterly clueless how to pronounce. I'll get it rolling with this one: writer Doug Moench. For years I pronounced it "Mench" until I heard it spoken as "Monk" at a convention. Doug: Yeah, I always read that as "Munch". When Karen told me the other day that it was "Monk", that was news to me! Here's one, and I think I read this in Back Issue: I always thought it was Len "Wine", but it is really Len "Ween". Spelled W-e-i-n, what would you think it was? Karen: I thought it was like "Wayne" until a few years ago! How about Bob McLeod? I think it's pronounced "McLoud" but I might be wrong. And hey, what about Bill Sienkiewicz? I saw it spelled out phonetically once but before that, I had no idea. Doug: Is it Sin-kay-vich, with the accent on the second syllable? Seems to me that I, too, either saw the phonetic spelling or heard it once. 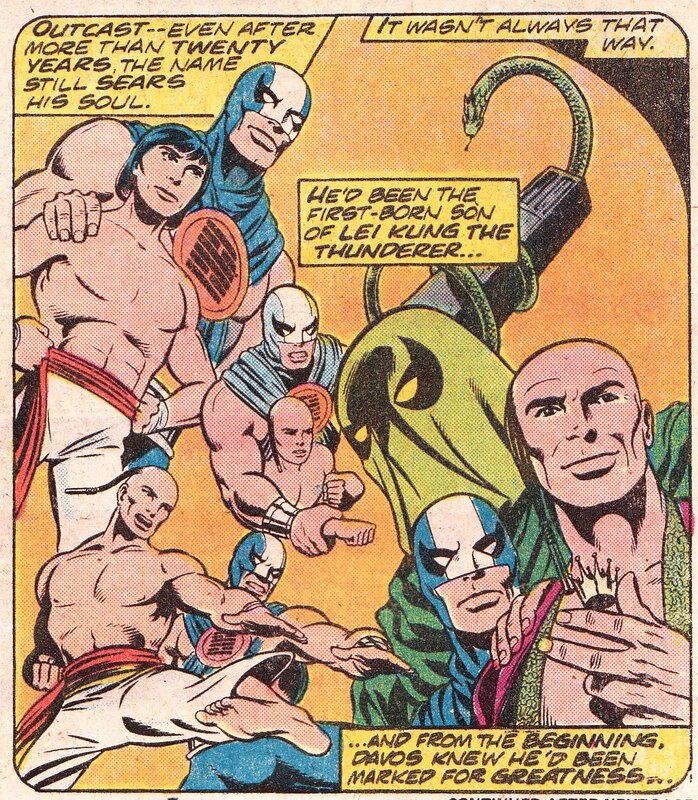 Well, how about a couple of BAB faves, the Buscema brothers? When I was but a wee lad, I pronounced it Busk-e-ma (accent on the first syllable), but I'm thinking it's Byoo-see-muh, with the accent on the second syllable. Of course as we're going through this, our readers should feel free to correct us -- obviously this post is not about us feeling smug! 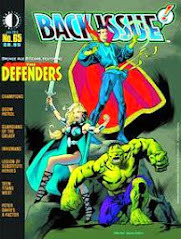 Karen: I actually did not know how to pronounce Buscema until I interviewed Gerry Conway for Back Issue and he said 'Byoo-sem-uh' -well, at least, that's how he pronounced it! Doug: Oh ho! Then my emphasis is all wrong -- sounds to me (the way I read it) that the accent goes on the first syllable. See, who says this blog isn't educational? How about one more? 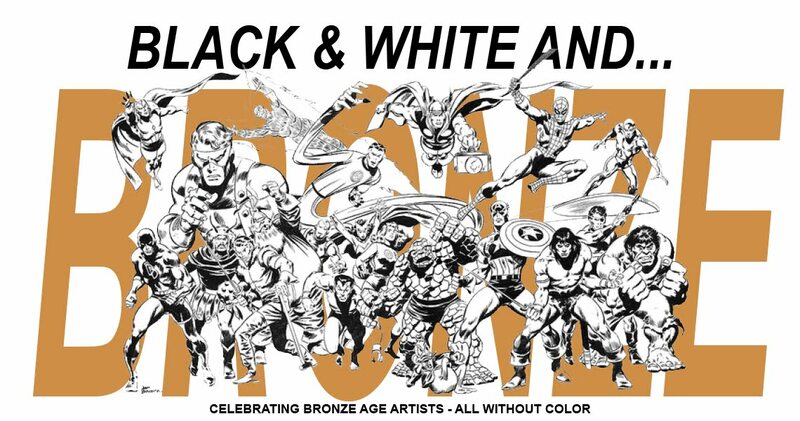 Moving ahead to the very end of the Bronze Age -- maybe even a bit beyond -- we come to Jackson "Butch" Guice. When he took over the Flash revival, I assumed his name was pronounced "Goo-chee". Nope. Then I thought it was "Gice". Nope. It is pronounced "Gwice", like "ice" with a hard G and a W in front. Hmmph. Doug: Up to you now, kids -- how many have shared our name-butchering travails? Are there other creators you get tongue-tied over? Let us know! Doug: We're heading into the second half of our month-long look at the Claremont/Byrne Marvel Team-Ups with an Iron Fist 2-parter. This one, friends, has some kung fu mayhem and really requires a little Danny Rand history for it to totally make sense. It's been well-documented in these parts that my partner has an infinitely larger background in the non-superhero books, so I'm going to lean heavily on Karen in terms of tying this together. Shall we? Karen: Iron Fist was a favorite of mine back in the 70's. I probably had about half of the Marvel Premiere issues featuring him, and all of his own title. But not a super-hero title? He has tights on! Doug: Fair enough on the tights, and I only had a couple of appearances of his. I guess my comment was slanted more toward the B&W magazines, where Mr. Rand also appeared. Doug: What a great splash page! I'm sure I've commented somewhere along the lines that the elongated figurework that would become a staple of John Byrne's post-Bronze Age output was not always to my liking. Here, early on (somewhat) we see Byrne's superheroes a bit more filled out, almost Romita-like. It's unmistakably Byrne, especially facially, but I think I like his style here a bit more than on, for example, his second run on Fantastic Four. Anyway, Iron Fist is shown in his gym. Seems he's lost a bit of his edge and is concerned that he'll need it if a life-and-death situation crops up. Ah, foreshadowing. While he pushes himself, who should soon appear at his door but one Peter Parker, on assignment for the Daily Bugle. Pete's supposed to photograph Danny Rand's townhome -- must have been for the Bugle's Sunday magazine section. Pete hands Danny a rolled up note that was stuck in the door; however, as soon as Danny reads it we know there isn't going to be a shoot today! Karen: I like how Peter thinks to himself that Rand's living room is bigger than his whole apartment! Poor Pete. Doug: Of course Pete's brushed off, and as he exits the building he scales the wall and changes into his Spidey gear. Looking over the roof, Spidey sees Danny Rand enter a taxi -- a well-placed Spider-tracer should take care of finding Rand's future location. Seems that as Danny had read the note from his door, he recognized it as a challenge from an old acquaintance. Karen: Peter's being a bit of a detective here, noticing not only Rand's sudden distress, but that he "moves like a trained athlete, and his hands - they're rough and calloused, like a fighter's." 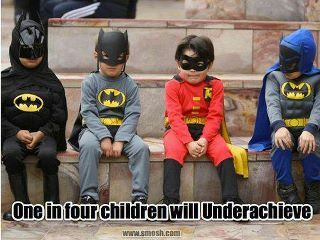 Doug: Junior Batman, that's our Pete! 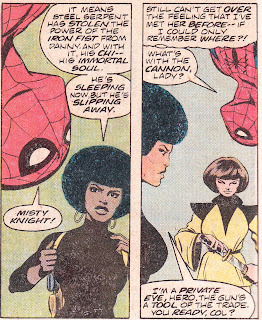 We then cut to a huge yacht off the Jersey coast, where Misty Knight (operating as a spy) is doing her best Pam Grier impersonation while cuddling up to a hood named Bushmaster. Our baddie has just been alerted that a hit will go down that very evening, a hit on Iron Fist! Misty, upon hearing that the object of her affection is in danger, tears into Bushmaster and his body guards. This is one bad mama! I was unaware that Misty had a "bionic right arm", but she uses it just as well as Jamie Sommers ever did! Misty commandeers a motor boat and speeds away from the yacht, her cover blown. She hopes to reach Iron Fist in time! Karen: The Iron Fist book was in the middle of a major storyline when it was canceled. Serendipitously, Claremont was writing MTU at the time, and what better place to tie up those loose ends? I have to wonder though if this story made much sense to the uninitiated. As for Misty, I agree, the whole sequence here made me think of Pam Grier or Teresa Graves (Anyone remember Get Christie Love?). I always thought her bionic arm was a little too gimmicky but it was the 70's after all. Doug: Spidey lost the cab in traffic, but upon catching up to the signal gets the drop on Iron Fist's location. 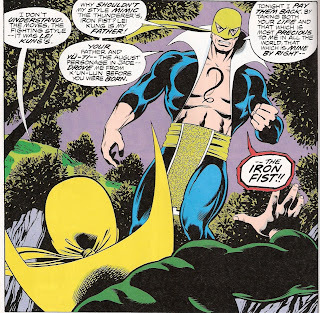 We move ahead a bit and find Iron Fist moving through the woods of a large city park, when he's suddenly confronted by the Steel Serpent, a mysterious figure claiming to be from before Iron Fist's past! With no chance to back out, Iron Fist instead confronts his bigger, stronger nemesis. 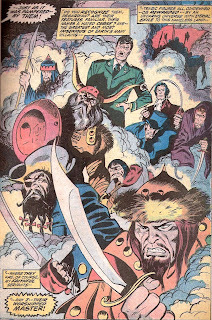 What follows is a couple of pages of kung fu fighting, and I have to ask -- how did Byrne do with the choreography? 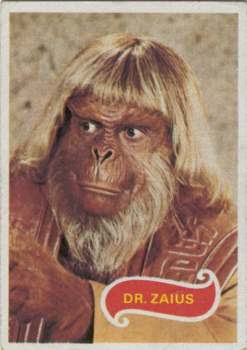 I've seen some Paul Gulacy Master of Kung Fu, and I guess for me this is not that. Karen: I love Steel Serpent's costume; the blue-green-white color scheme and the wide sash just look great. I think Byrne does good work with the fight scene. 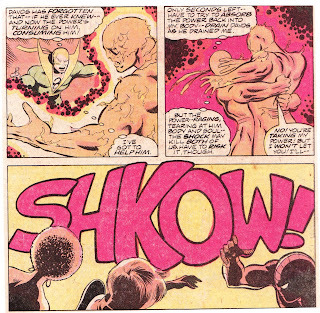 But Claremont has Iron Fist giving a mental play by play of what moves are being used that is just flat-out ridiculous. These two expert fighters are moving at lightning speed and Fist is thinking, "I just did this, now he's countering with that, but I'll do this..." I get the feeling Claremont wanted to show the readers how much research he had done, and it just fails miserably. Doug: Perhaps it was indeed the words I found distracting -- maybe my questioning of the pictures is misplaced. But something did feel off about the battle scenes. It's interesting that we can see the Steel Serpent's eyes in his mask, while Iron Fist, whose costume is basically the same, has the "Spider-Man" eyes. 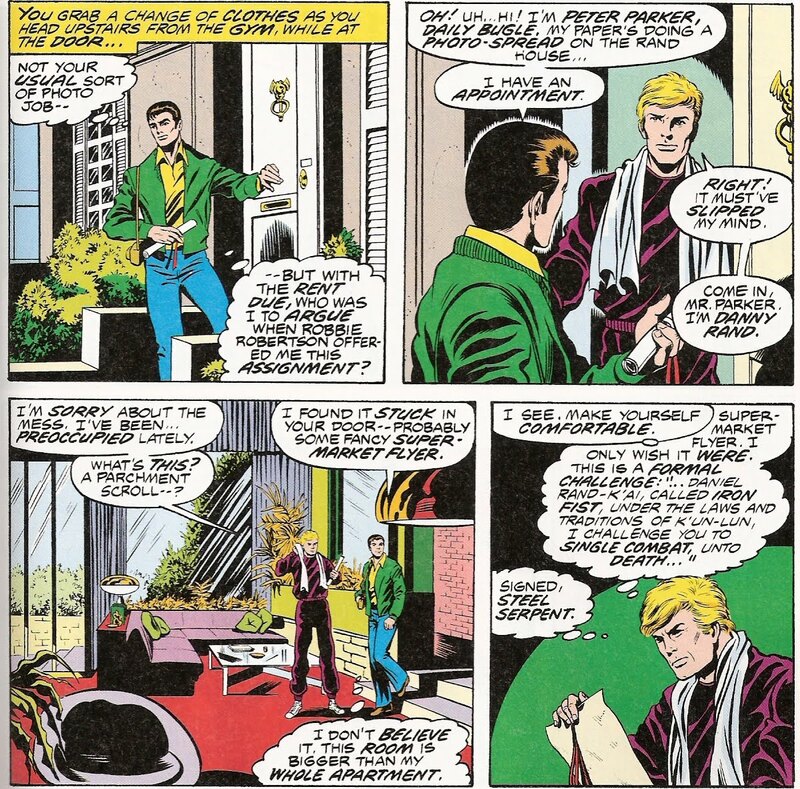 Doug: Well, this is after all Marvel Team-Up, so despite the fact that Iron Fist probably knew what he was doing, Spider-Man decides to intervene on his behalf -- after setting up his remote camera, natch! Steel Serpent is having none of it, however, and spider-strength, -speed, and -agility don't seem to amount to a hill of beans in this fracas. 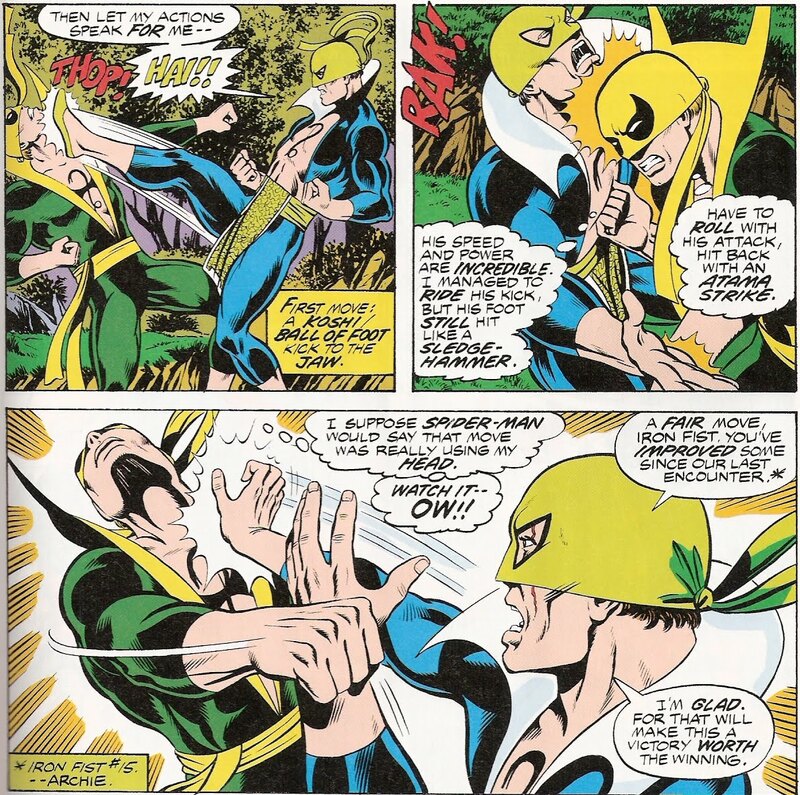 Spider-man is taken out immediately, and in the distraction Iron Fist loses his focus (something he'd been lamenting as our story began) and allows Steel Serpent to get into close quarters. 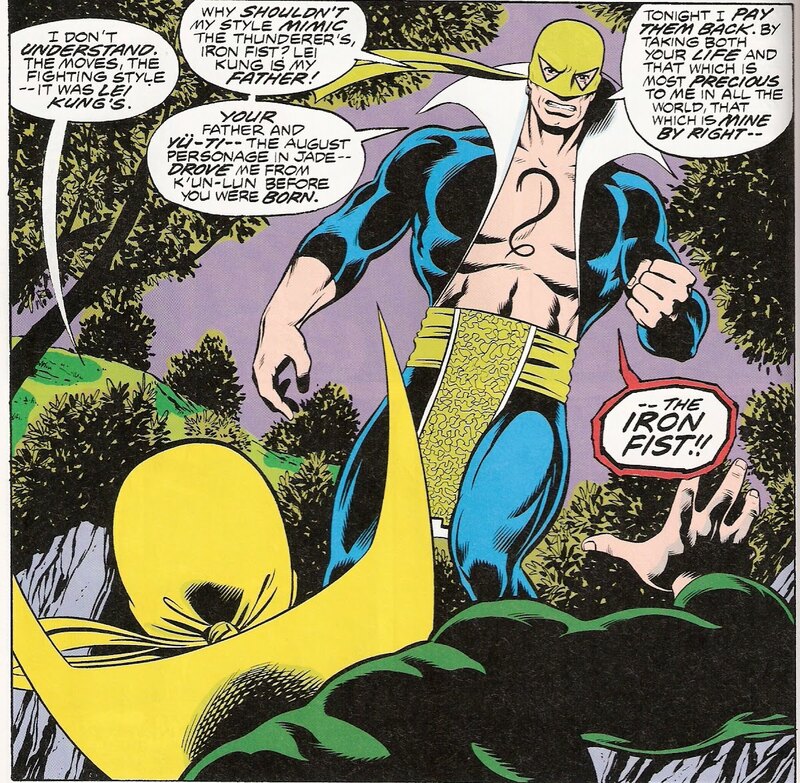 Pressing his own serpent tattoo against Danny's dragon tattoo, the chi, or life energy, is drained from Iron Fist and into Steel Serpent. In a blinding flash of light, Iron Fist lies defeated at the feet of his conqueror. Karen: I thought the full-page drawing here was very effective, with Serpent bristling with energy and Fist falling away like a rag doll. Doug: Misty arrives just as this goes down, and she's not happy. Brandishing a ray gun, she threatens Steel Serpent and tells him to put Iron Fist down and back away. Content that his mission is accomplished, Steel Serpent obliges, and fades away into the forest. Spider-Man, recovered, approaches Iron Fist's lifeless body. 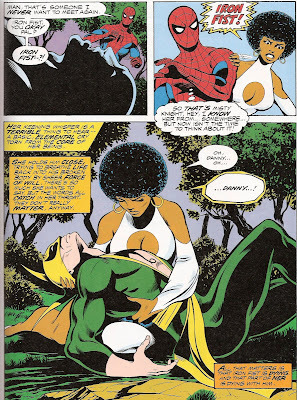 He's suddenly brushed aside by a frantic Misty Knight, who kneels and cradles Iron Fist in a pose reminiscent of The Pieta of Michelangelo. As they say, to be continued! Of the three characters pictured, who has the most iconic weapon? Which is more closely associated with its master, and which character is more differently portrayed without it (please discount the "Don Blake 60-second rule")? Which do you like better? For a broader version of this discussion, check out Karen's Open Forum from about a year ago. Doug: Welcome to the second installment of a month of random Thors. Last week the God of Thunder and his father were caught up in a tiff with the uber-nasty, Infinity. Today's heavy-hitter is the epitome of nasty. Karen: You know, I didn't mind Vinnie here, but then, I did like how he looked with Kirby on the title. 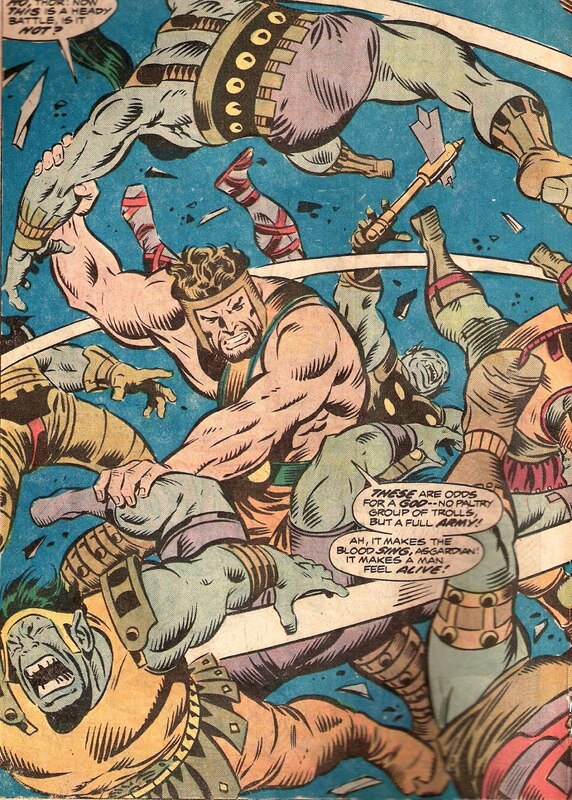 However, I'll agree that there are better inkers for Buscema. Doug: This story is not unlike one of the Mephisto/Silver Surfer yarns played out in the Surfer's mag, or some of the later graphic novels. 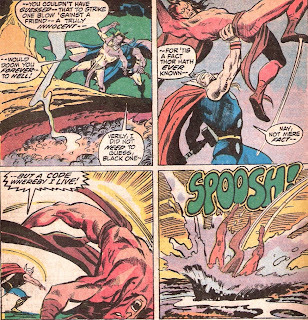 Where this book differs is that the God of Thunder has a certain brashness about him, and while just as noble as Norrin Radd, Thor's just not gonna take the devil's crap lying down. As we begin, the entire cast is in the depths of Hell, as Mephisto threatens to take over the Earth. 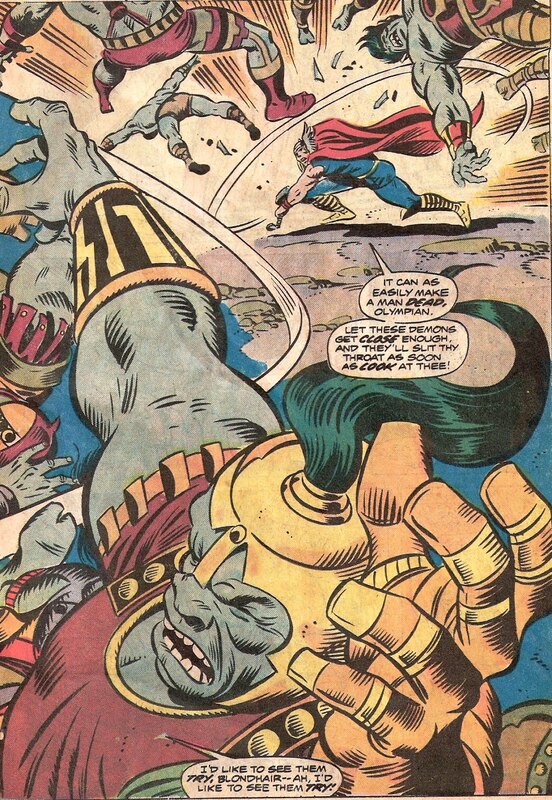 But in order to do so, he must vanquish Earth's most noble soul -- Thor's. And to do that, the Thunder God will face trial after trial. Karen: I think you nailed it. Thor is subbing for the Surfer in this story. 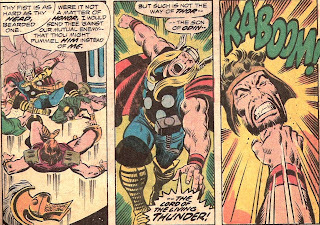 Although I've never thought of the thunder god as being particularly messianic. Uncharacteristically chivalrous for a Viking god, yes. But not Christ-like. Doug: The first trial is against an army of demons. Strong, fighting tooth and nail amidst the blazing fires, the demons stick to Thor. 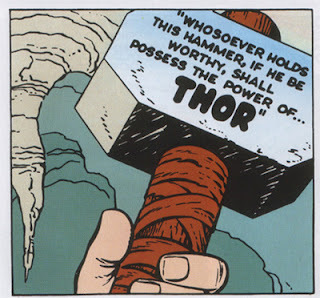 But with the enchantment of Mjolnir, he scatters them. 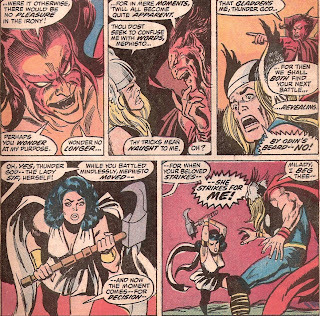 Mephisto then goes right to his best trump card, a possessed Lady Sif. She comes at Thor with an axe, and raises it to smite her beloved. 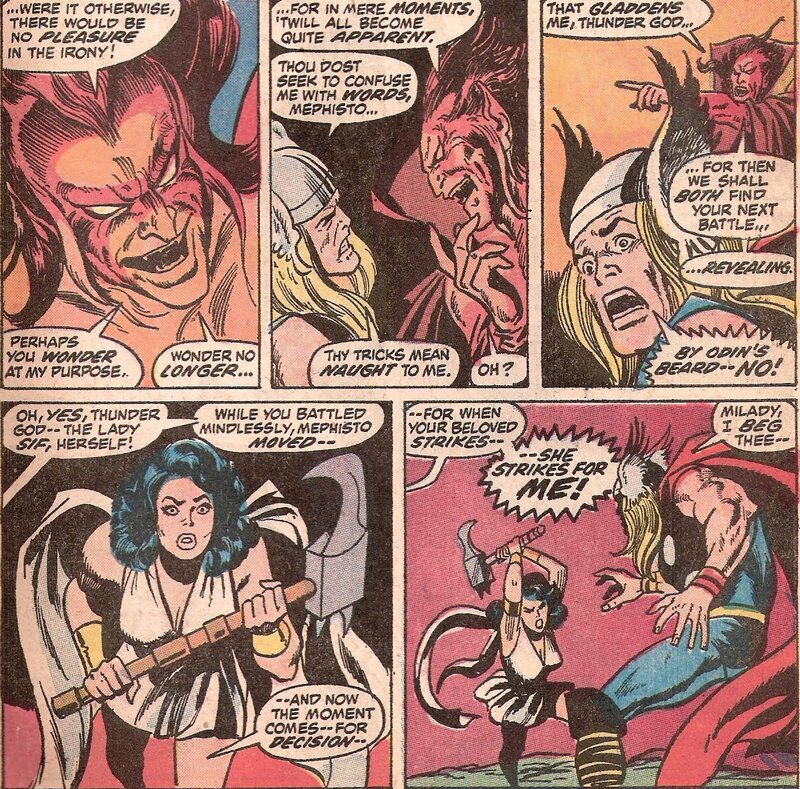 Thor dodges, disarms his lady, and tells Mephisto that he will not win with such tactics. So the demon-lord moves to his next strategy -- the possession of men of influence from around the world. 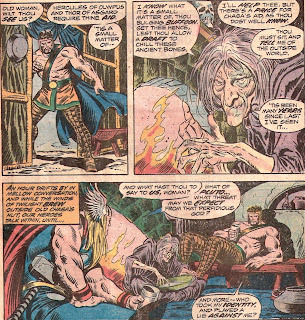 But before that plan can even see its fruition, Mephisto segues right into the next dark machination -- an attack by Balder the Brave and the Warriors Three. Karen: Hmm, this book was published in 1972. Would readers have been shocked at the idea of politicians possessed by demons? Even before Watergate, that doesn't seem too big a leap! Doug: Well, there must be some explanation... Thor will have none of this plot, either. Rather than lay a hand on his devoted friends, the Thunder God first defends himself and then uses Mjolnir to create a vortex. 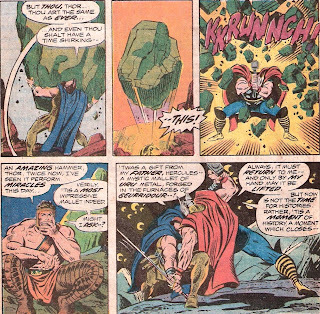 The entranced Asgardians are transported to the top of a rocky tower, and the mystical hammer then propels boulders after them to encase them -- a barrier of protection from Mephisto. As Thor turns to face his tormentor, a spell is cast and the evil one summons those who have worshiped him throughout history -- some of the vilest men to have ever walked the Earth. Among them scowl the visages of Genghis Khan, Blackbeard, Jack the Ripper, and Adolf Hitler. Along with the Fuhrer comes a ragtag band of SS... the God of Thunder shows no mercy, as Mjolnir tears through the assemblage. Thor uses his mallet again to dispense the Mongols. Karen: It's absolutely amazing all the stuff that hammer could do! Thor really was Marvel's Superman back then. I'm just waiting for Mjolnir to somehow give Thor the power of ventriloquism! Of course, seeing Thor take on hellish Nazis was fun, even if only for a panel or two. Doug: Mephisto is now getting a bit more than peeved. 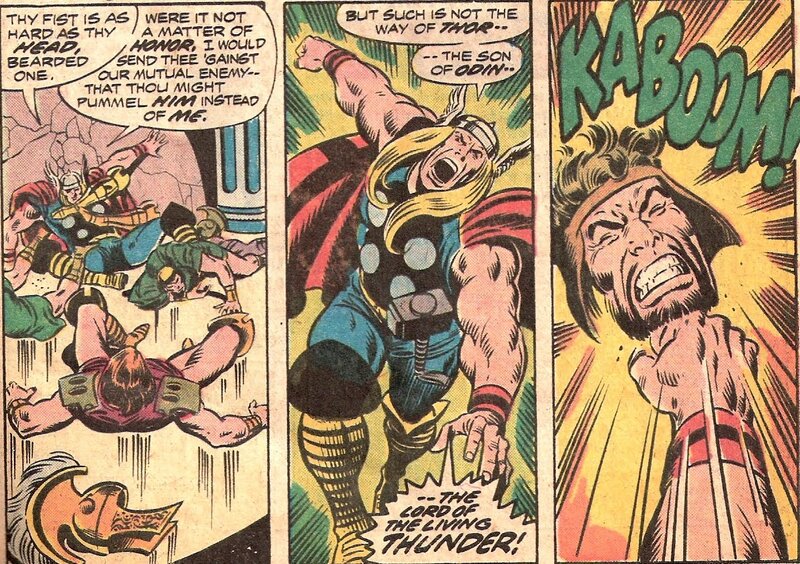 He screams at Thor that he must have his immortal soul. Thor again wades through an army of oppressors to finally reach the devil himself. But upon laying a hand on Mephisto, the Thunder God begins to burn. As Mephisto turns up the heat (literally), Thor whacks him full across the chops with his hammer, staggering the demon. 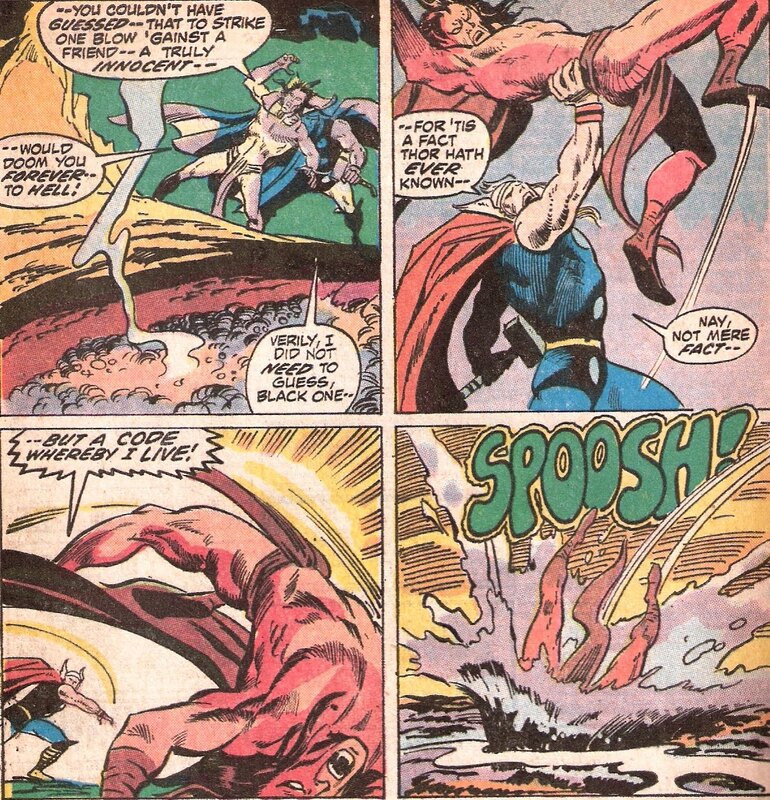 When Mephisto tries to bury Thor with a boulder, the Thunder God instead launches himself right into the devil's gut and puts him in a choke hold. Picking the dark lord off the ground and holding him high, Thor propels him headlong into a pit of lava. 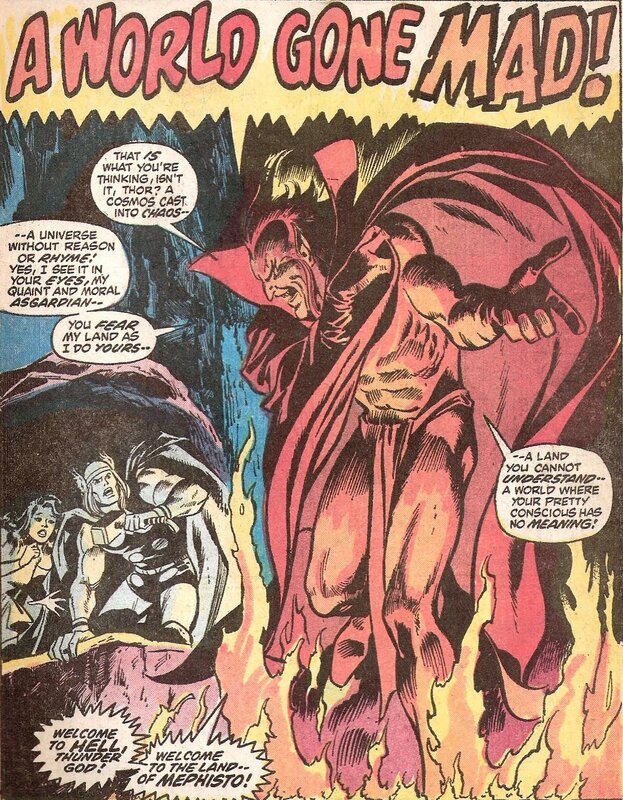 As Mephisto surfaces defiantly, Thor rains down tons and tons of rock, effectively sealing the demon beneath the lava. Beginning the journey back to the surface world, Thor fears that he must now face life alone. He is jubilant to find that when Mephisto fell silent, his spells over the Asgardians were broken. Karen: How tough is Mephisto anyway? 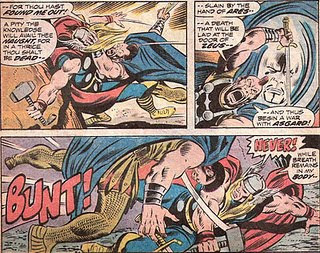 He really gives Thor a tussle here. I'd always thought of him in a more metaphysical sense, causing heroes to go through spiritual crises, but in this ish he goes mano a mano with Thor quite impressively. Doug: This issue was sort of a mixed bag for me. 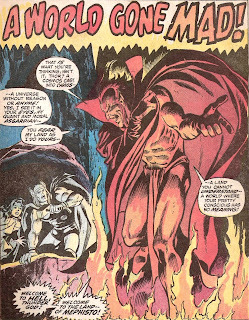 On the one hand, you really can't beat John Buscema's rendering of Mephisto... he simply owns that character. And while Buscema's figurework was evident, Colletta's sometimes-sloppy inking often buried the grandeur of those pencils. As to Conway's script, it was definitely serviceable, but not wholly unpredictable. 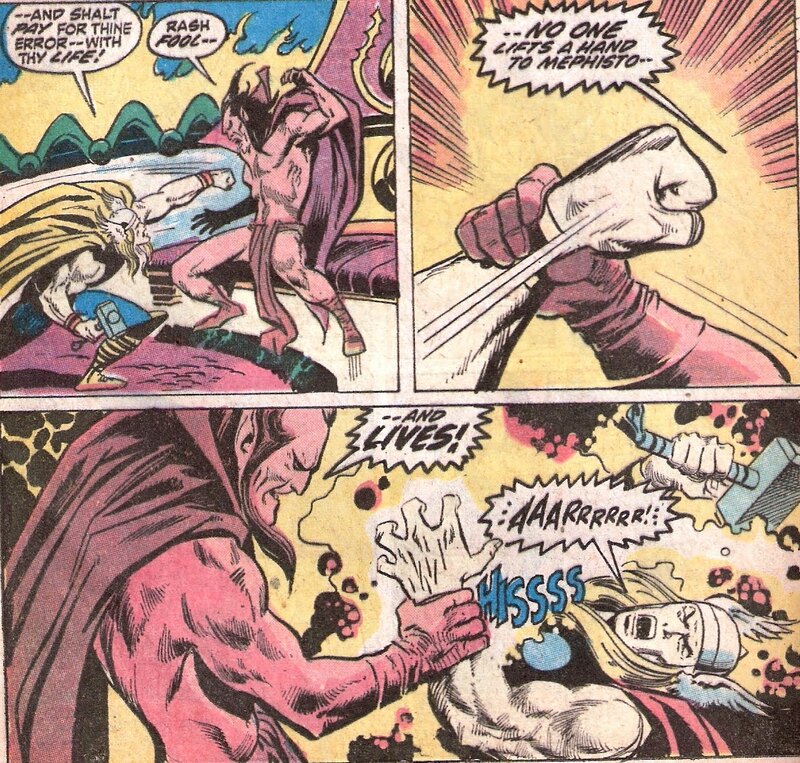 That the endgame was brought about by Thor's figuring out that had he struck back against any of his friends Mephisto would have owned his soul, was a fair conclusion. In the end it was one big battle issue, and for a superhero mag that can't be all bad. That it took place with all sorts of vile characters did make it visually interesting. Karen: The story itself was, as you say, serviceable, but not Conway's best on the title. 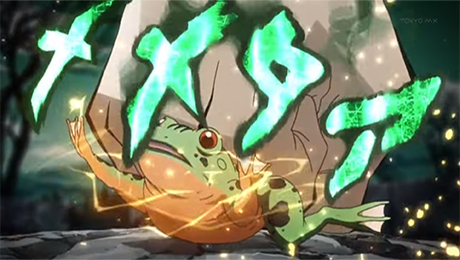 It was however, a nice showcase for the thunder god's innate nobility, as well as his sheer power. 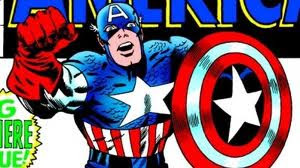 Who is the Most Essential Avenger?